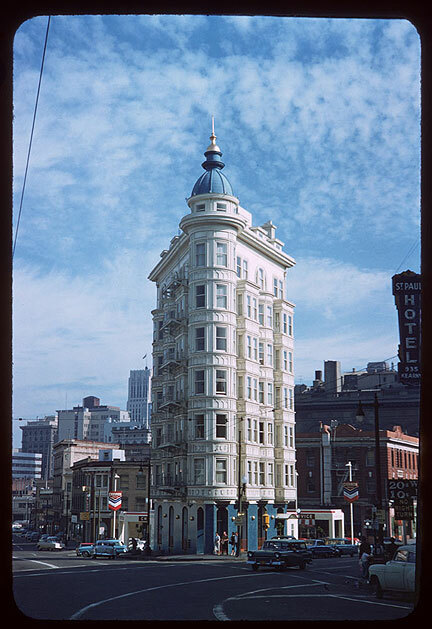 The Sentinel Building at Kearny and Columbus, April 3, 1960. Note the red brick building to its right, which is the International Hotel. Sentinel Building at night, January 2017. 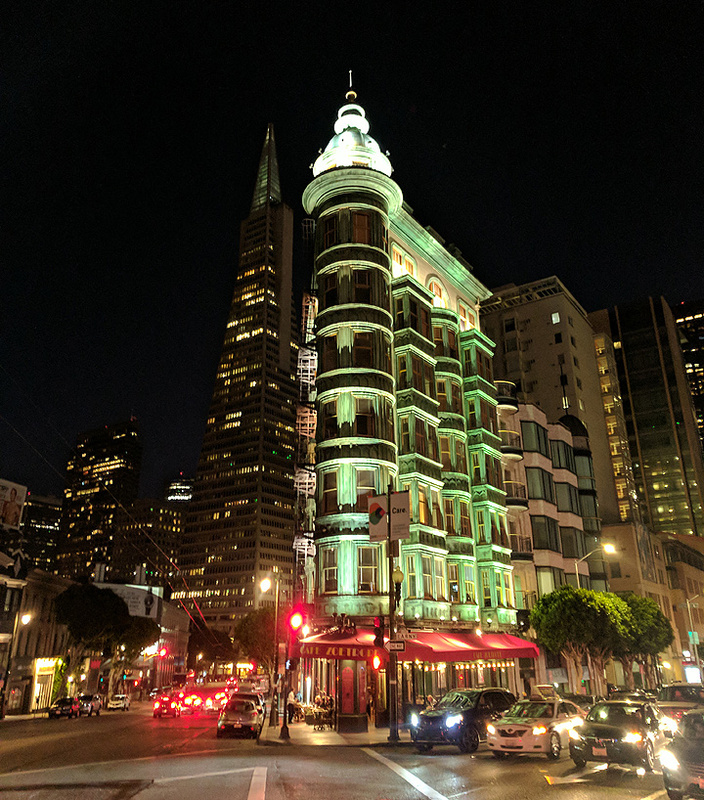 These days the triangular-shaped building at 916 Kearny St. is the center for enterprises engaged in by its owner, film director and vintner Francis Ford Coppola. While film buffs may pay homage at the location where “The Godfather” was edited, students of bad government should pay heed, too. This was the building where San Francisco’s most notorious political boss, Abe Ruef, tried to do business during his final years. Ruef developed this structure, then known as the Sentinel Building, in 1906 at the height of his political power. Nearing completion, all but its steel frame was destroyed in the 1906 earthquake and fire. It was soon rebuilt, but for five years Ruef was unable to use it as his headquarters, the reason being that he was an inmate at San Quentin Prison. 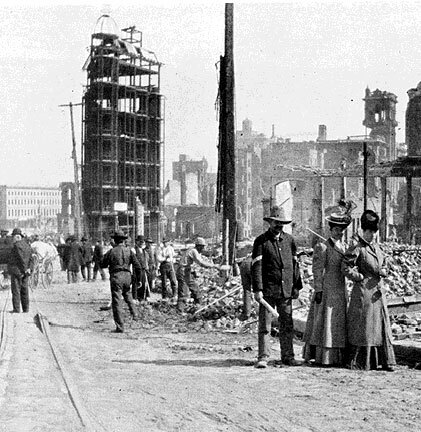 Sentinel Building under construction, in aftermath of 1906 earthquake and fire. 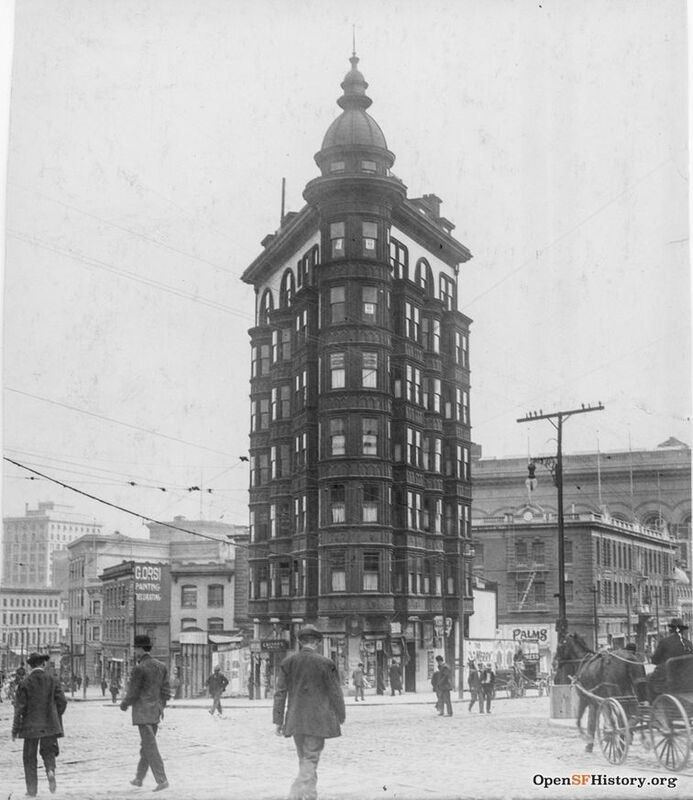 Sentinel Building, aka Columbus Tower, c. 1915. How Ruef ended up in prison is a story worth telling. He was not exactly your up-from-the-streets Tammany Hall-type boss. 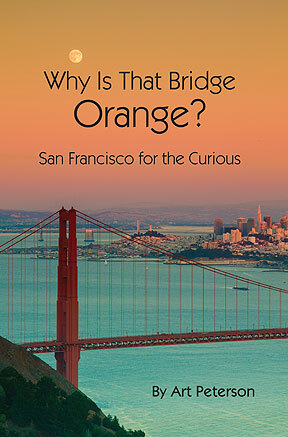 A native San Franciscan from a prominent Jewish family, Ruef graduated from the University of California at age 18, was able to speak eight languages, including Cantonese, and was admitted to the California Bar at age 21. Initially drawn to reform politics, and corresponding with the likes of Theodore Roosevelt, the undertow of political corruption proved too tempting for his ambitious instincts. Neither the Democrats nor Republicans had much use for Ruef, nor he for them. Recognizing that working people in San Francisco had nowhere to turn to in a political system in which parties kowtowed to the Southern Pacific railroad and used the police to protect strikebreakers, Ruef decided to organize another party, the aptly named Union Labor Party. Ruef considered the strictures of public office too confining. So with a mayoral election coming up the boss needed a malleable candidate to do his bidding. He found the perfect stooge in Eugene Schmitz, a violinist and president of the local musicians’ union, a politically empty vessel. Schooling Schmitz in the art of California politics, Ruef had his prodigy memorize the state Constitution and the City Charter. Schmitz was able to smoothly deliver the speeches that Ruef wrote for him. Surprising everybody but Ruef, Schmitz won. Within a couple of years, members of the Union Labor Party, mostly made up of semiliterate and inexperienced pols eager to partake in the spoils of government, dominated the Board of Supervisors. Ruef set up a system that looked out for his colleagues, but mostly for himself. If the telephone company or the electric company wanted a particular piece of legislation passed or stopped, they would hire the legal consultancy services of Abe Ruef for a retainer starting at $10,000 or so. He would take his 50 percent cut, then pass on the remainder to Schmitz and the supervisors to be divided up. 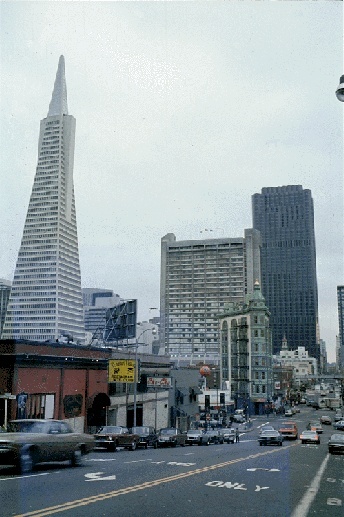 View of The TransAmerica Building (left) and the Sentinel Building, to the right of center. This worked well enough before the scandal of the “French restaurants.” The restaurants might be serving coq au vin on the ground floor, but the upper floors were sexual smorgasbords for the rich. With the prodding of maverick District Attorney William Langdon, the city embarked on one of its periodic binges of morality and the French restaurants, which — sure enough — were “clients” of Abe Ruef, were caught in the crossfire. Running scared, some of Ruef’s colleagues turned on him, leading to his arrest. After a painfully long trial, characterized by enough defense dodges to provide any loophole-conscious lawyer with textbook lessons, Ruef was convicted and sentenced to 14 years in prison of which he served five. On his release, he set up offices on the top floors of the Sentinel Building, where he must have enjoyed the view, but did little business. He died penniless in 1936.